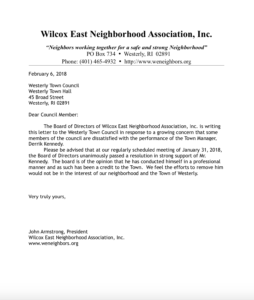 The Board of Directors of Wilcox East Neighborhood Association, Inc. is writing this letter to the Westerly Town Council in response to a growing concern that some members of the council are dissatisfied with the performance of the Town Manager, Derrik Kennedy. Please be advised that at our regularly scheduled meeting of January 31, 2018, the Board of Directors unanimously passed a resolution in strong support of Mr. Kennedy. The board is of the opinion that he has conducted himself in a professional manner and as such has been a credit to the Town. We feel the efforts to remove him would not be in the interest of our neighborhood and the Town of Westerly. Wilcox East Neighborhood Association, Inc.